With these traditional German chocolate cake recipes, you can make chocolate cakes from scratch that taste Old World delicious. Believe me, you will want to give these old fashioned chocolate kuchen recipes a try. Make dessert cakes that you'll be proud to serve. Treat yourself to a slice of homemade kuchen today! Boil together chocolate, sugar and milk. Add butter and when cool add yolk of eggs; then the flour, flavoring and stiffly beaten whites of 2 eggs. Beat all thoroughly and bake in a loaf or layers till done. Boil together 5 tablespoonfuls grated chocolate, 3/4 cup granulated sugar, 2 tablespoonfuls milk, 1 egg. When the mixture begins to thicken and look creamy, spread on cake. If baked in layers, ice on top and between the two layers. One cup of flour, 1 teaspoonful of baking powder and 1 cup of granulated sugar were sifted together. Two eggs were broken into a cup, also 1 large tablespoonful of melted butter. Fill up the cup with sweet milk, beat all ingredients well together. Flavor with vanilla and add 2 extra tablespoonfuls of flour to the mixture. Bake in two layer cake pans. Place the following mixture between the two layers: 1/2 cup of grated chocolate, 1/2 cup sugar and 1/4 cup of liquid coffee. Cook together a short time until the consistency of thick cream, then spread between layers. One-half cup of brown sugar, 1/2 cup of sweet milk and 1/2 cup of grated, unsweetened chocolate. Boil all together until thick as cream; allow it to cool. Mix 1/2 cup of butter with 1/2 cup of brown sugar. Add two beaten eggs, 2/3 of a cup of sweet milk and vanilla flavoring to taste. Beat this into the boiled mixture and add 2 cups of flour sifted with 2 teaspoonfuls of baking powder. Bake in three layers and put together with chocolate icing, or cocoa filling. Place all the ingredients in a bowl and mix to a smooth paste with cold coffee. Flavor with vanilla and spread on cake. Six yolks of eggs and 1 cup sugar, creamed together. Beat about 15 minutes. Add 1 teaspoonful allspice, 1 teaspoonful cloves, 1 cup Baker's chocolate, which had been grated, melted and cooled; 1 cup stale rye bread crumbs, crushed fine with rolling-pin. Lastly, add the stiffly beaten whites of 6 eggs, a pinch of salt and 1/2 teaspoonful of baking powder sifted over the batter. 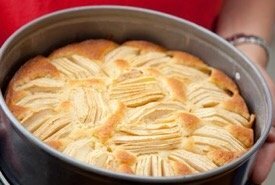 Put into a small cake pan and bake half an hour in a moderate oven. When eggs are cheap and plentiful and when you have left over rye bread, this is an economical cake, as no flour is used. 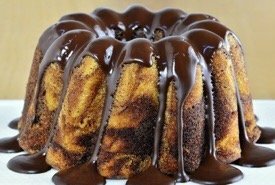 It is a delicious and resembles an ordinary chocolate cake. The German kuchen (cake) is world-famous for its delicious layers separated by a delectable, sweet filling and in Mary's recipe above, the filling is a creamy rich chocolate that's lightly flavored with coffee and vanilla. You'll want to make the chocolate loaf too — so simple yet so delicious! 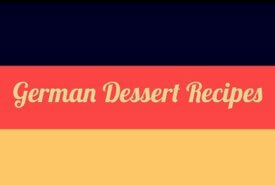 Traditional German cake recipes are easy to make and call for all-natural, ingredients. You'll love making them, and you'll love eating them even more. They're chock full of goodness. So don't pass these up!